This page may require cleanup to meet basic quality standards. The specific problem is: Verify instructions and fixes against the latest version, make fixes cross-platform in description. You can help by modifying the article. The discussion page may contain useful suggestions. Retail base game does not work on Windows Vista and later (see Retail base game does not work). SafeDisc DRM[Note 1]. 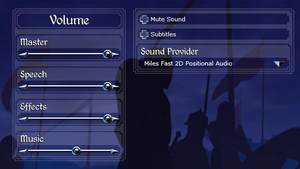 CD key for multiplayer. Gold edition no Steam 2 dvd is drm free. 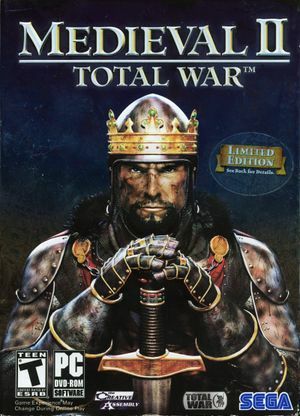 Comes bundled with Medieval II: Total War - Gold Edition. A combination of bug fixes, many small mods, better AI and AI armies, more provinces, graphical improvements and many other campaign and battle map changes. The whole game now offers a much greater challenge! A total conversion mod that brings you to the world of Middle-earth during the Third Age. Includes both a standard campaign mode and a Fellowship of the Ring campaign that follows the events of the books. Master, speech, effects and music. 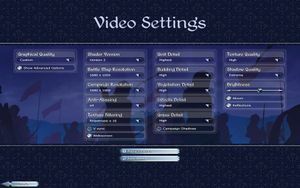 Added in Kingdoms expansion; use Retrofit Mod for original campaigns. GameSpy is offline; activate key on Steam to use new servers. Mac App Store players can only play with other Mac App Store users. The retail version of the base game does not work on Windows Vista and later due to SafeDisc support being discontinued. Activate the CD key on Steam and use the Steam version. The retail Kingdoms expansion is still compatible. Use Bare Geomod to play Medieval II's Grand Campaign with Kingdoms. Start the SafeDisc service (see MS15-097 for instructions). This method does not work on Windows 10. Only applies to reinforcements delayed claimed due to needing to upgrade your system. This doesn't affect reinforcements being delayed through random chance (e.g. you have no word on when your reinforcements will arrive), nor does it apply to reinforcements blocked because of insufficient graphics card memory. Intel HD Graphics 4000/5000 require 8GB of RAM. AMD graphics cards are not officially supported on SteamOS. Nvidia GeForce 600 series and newer require driver version 352.55, AMD Radeon R7/R9 300 series and Intel Iris Pro Graphics require Mesa 11.2 driver. ↑ 1.0 1.1 1.2 1.3 MEDIEVAL II: Total War multiplayer now available on Steam! ↑ Total War Center - How to fix " Reinforcements Delayed problem "